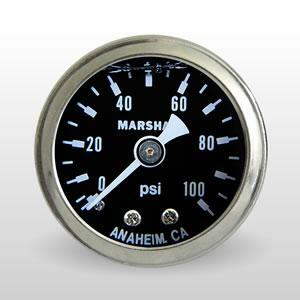 The Marshall mechanical fuel pressure gauge is ideal for installing directly on the fuel rail or fuel pressure regulator. It has a 1/8” NPT male thread commonly used on most fuel components. 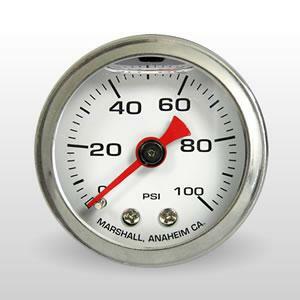 The gauge measures from 0-100psi. Liquid filled gauges provide a number of advantages. The liquid absorbs vibration making it easier to read. Less vibrations also mean reduced wear on the gauge.